The Ten of Swords indicate a major disaster of some sort. It shows that a certain force of extreme magnitude has come to hit you in your life - one that you may have not foreseen. There is a sense of betrayal that is indicated here, for the character is stabbed in the back. This seems to be a reminder that despite how much we try, we cannot control everything - there are things that are beyond our ability to change. Here, this situation is unavoidable. The tale of the suit of swords is a powerful metaphor, one that ends in tragedy. The swords are a symbol of the intellect, of intelligence and logic, and yet we find the final culmination of this suit a complete and total defeat of the spirit. We must realize that the swords are a weapon that can have immense potential for destruction or for good. The story as it unfolds from the ace to the ten is one where an untrained individual uses this weapon for faulty reasons - makes many mistakes, and then spends an entire lifetime attempting to run away from the power that he misused. The story as it unfolds from the ace to the ten is one where an untrained individual uses this weapon for faulty reasons - makes many mistakes, and then spends an entire lifetime attempting to run away from the power that he misused. This person believes the swords are external to him when they are part of him, and when they inevitably return, he once again suffers. His pain is not the pain of his circumstances usually, but the pain of fear, of anxiety, of not being able to be a master of his surroundings. After the hopelessness of the nine of swords, what could have happened? Were you overwhelmed by the pressure? Or did you take the final sword upon yourself and admit defeat? 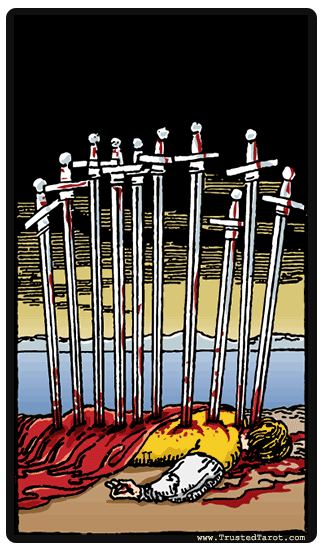 The Ten of Swords depicts that situation where your mentality is ‘poor me , you feel like there is nothing you can do. Pause and remember that as with the death card, the end of something means a new beginning. Let go of what you have lost, and focus on the new path forward because that is where your life is meant to go. A good example is a break-up with your partner - though it could be intensely painful, it could also be the beginning of a new sense of independence. When we see any version of the Ten of Swords , the feelings are powerful. Whether reversed or upright, the card signals the finality of defeat. There is no way to avoid this tragedy - it has happened over a long course of events that have been a long time coming. With the reversal though, also comes to a recognition that you have hit rock bottom, there is no more that is left for you to give. With that also comes the release that things can only get better and the cycle can start anew. But like with the eight and nine of swords, this release must be initiated by you. There is an opportunity being presented here to correct what has hurt you, but you must make the effort to climb out yourself. What has happened was terrible, but everyone has a part in the responsibility.